← Long Live the King! Leave it to the nightly news — and Mother Nature — to give me friendly reminders of just how great I’ve got it and how truly lucky I am in the grand scheme of things. My heart goes out to all the folks on the East Coast who are fighting against the fury that Mother Nature recently unleashed on them. As Hurricane Irene rages and howls like a scorned lover 3,000 miles away, some of us on the other side of the continent are still trying to beat the heat with air conditioners and ceiling fans running day and night. August is typically very hot in this part of sunny California, but this year we’ve been spared the usual brunt of a heat wave on steroids. Though she seems to have missed her annual stride, it is indeed still Summer, so the calendar assures us. And, it’s supposed to be near 100 degrees here today, which doesn’t mean a thing to me as long as my air conditioner maintains its dedication to my comfort. I am happily cool as a cucumber inside the house, typing away at my dining room table below a humming ceiling fan, while a homemade pie crust chills itself to the proper temp in the fridge. But note this: a change is coming. Last week, I saw it firsthand — the sure sign that Summer is getting her hat and coat and is about to leave the party. Every year in late August I witness the first falling leaves from my ginormous silver-leaf maple tree off the back deck. The fragile foliage isn’t exhibiting the typical Autumn colors at this point, but the leaves are dry and crumble easily to the touch — a sure sign that Fall is on his way. As if that wasn’t sign enough, my visit this week to Costco clinched it. The Halloween candy display is already stocked to the ceiling, and the Christmas ribbon display — oodles and oodles of colorful, festive wire ribbon — is out front and center in the middle of the store, right before you get to the wine section. Holiday Party Central! Everyone knows that Costco is the definitive barometer of seasonal fluctuation. The switch from Summer to Fall is a special time in this geographic zone. With much gratitude, we fling open our windows and patio doors and allow the punctual, cooling Delta breeze to work her magic. It’s a time when air conditioners hang Gone Fishin’ signs and take their much-deserved break from duty. If we’re lucky, our heaters and air conditioners can stay quiet for many weeks at one point in the year, as the day-long temperature outside hovers somewhere between Pleasingly Pleasant and Just Right. As the climate changes, so, too, does my appetite. My eyes see a dried-up leaf and just like that my taste buds are lobbying for hearty soups and stews, roasted root vegetables, and pumpkin pie. OK, maybe I’m rushing it a bit, but is there some rule that says to roast the butternut squash only in months whose names end in ber? Or, no pumpkin pie before Thanksgiving? No, I thought not. My grandmother used to say, “Don’t ever look back, something might be gaining on you.” Well, as long as my tomato plants are still producing their ruby red jewels — and Mother Nature does the Hokey Pokey with the temperature gauge — I will go back and forth from Summer to Fall in an effort to appease my finicky food cravings. Yesterday: fresh tomato, mozzarella and basil salad. Today: a beautiful, bronze Pumpkin Cheese Pie with Nut-Crunch Topping. Tomorrow: who knows? This is your standard pumpkin pie — but in Jimmy Choo stilettos! It’s Comfortably Familiar meets New & Exciting. In other words, for the pumpkin pie lovers around your important dinner party table, it is the Holy Grail of show stoppers. It’s from my mother’s recipe file, and is fairly new to our family gatherings. For as far back as I can remember, Mom made a delicious standard pumpkin pie — with homemade crust, of course. 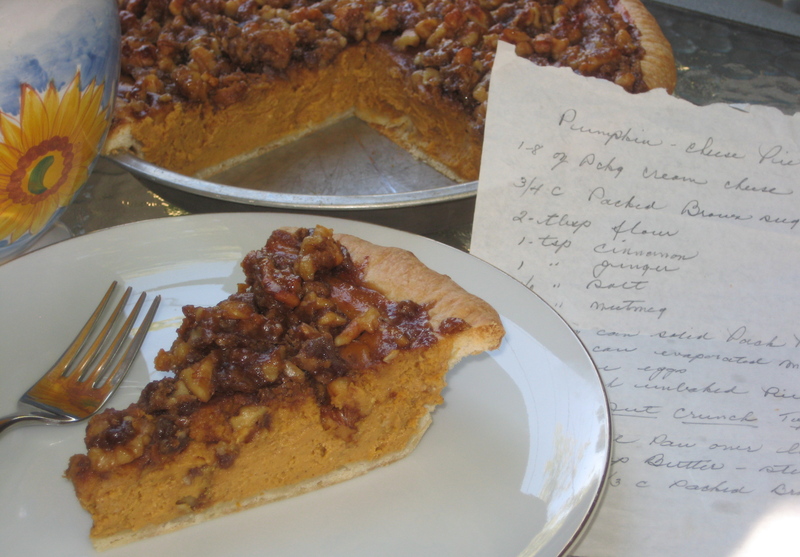 But when she found this recipe (origin unknown; possibly a Martha Stewart gem), it quickly became our Fall family favorite. Preheat oven to 375 degrees. In a large mixing bowl beat together the first 7 ingredients; add pumpkin and evaporated milk, and blend; add eggs, one at a time; beat until well blended. Pour into pie crust and bake for 30 minutes. NUT-CRUNCH TOPPING — In a sauce pan over low heat, melt 2 tablespoons butter; stir in 3/4 cup coarsely chopped nuts, such as walnuts or pecans; add 1/3 cup packed brown sugar. Mix all together and remove from heat. This entry was posted in Comfort Food -- Sweet, Desserts and tagged Autumn, Costco, Delta breeze, Fall, hurricane, leaves, maple tree, Mother Nature, pie, pumpkin, summer, weather. Bookmark the permalink. 2 Responses to Falling Leaves, Delta Breezes, and Pie — Oh, My! OMG! I can’t wait to make this. One year we had someone make us a pumpkin cheesecake for Thanksgiving and it was amazing, the best dessert we ever had, so…….no pressure for your recipe. Oh, you will love it — and so will your guests! In fact . . . now that I know you like pumpkin desserts . . . I just might have to make one for you to say thanks for all the beautiful bounty of veggies you’ve shared from your garden.